We are continuing our ‘snapshot of the past’ photograph series. Each week, we will be uploading an interesting image that we are digitising from our designated Cable and Wireless Business Archive. The photographs provide a fascinating look into the past and the rich heritage associated with Porthcurno. 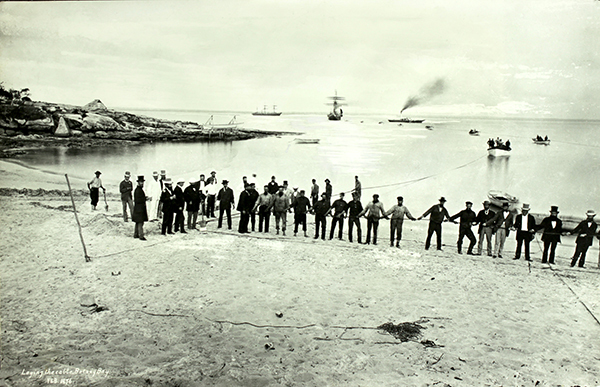 This week’s photograph shows the first cable from Australia to New Zealand being laid on the beach of Botany Bay, Australia (1876). This was a ceremonial event, and if you look closely there are quite a few men in formal clothes and top hats. As one of the partner museums in the Cornwall Museums Partnership, we received funding from Arts Council England to improve the access to this rich historical resource, recognised as being of national and international importance. There are an estimated 10,000 photographs in the Cable and Wireless Archive ranging in date from the 1850’s to the present day.